Scrap Dealers: Determine the value of your scrap gold, sterling or platinum. Note: Our calculators are intended for use by Professional Scrap Dealers only. Set weight: Pennyweights (Dwts) or Grams. Enter weight for each category. Select the ‘Calculate’ button at the bottom to get the total. 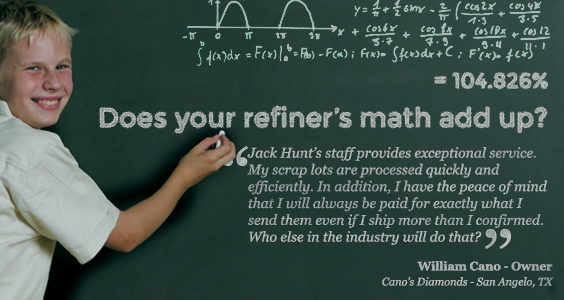 Due to the constant changes in the Spot Price, the Scrap Calculator provides market indications of what your karat scrap lot is worth and is not a confirmation of Jack Hunt Coin Broker’s scrap purchase price. Please call for purchase price: (800)877-7424. See above for approximate spot price. Formulas automatically adjust to unit of weight selected. Determine your margins on scrap calculations. Enter your desired margin factor as either a percentage of sale, cash per dwt, or cash per gram basis below. Click "Save Margins" for them to take effect.